Play Bingo – Play Slots – Play Casino – all at Bingo Café! They have bonus offers, an excellent Bingo Schedule, Free Bingo, Mega Bingo, Tourneys & Competitions and More! Your even start off with £10 Free to try things out. 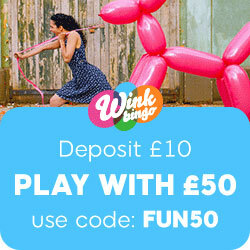 Not certain what games you’d like to start off with, well when you log onto the Café go straight through to the Preview Games tab, click and you will find info there about all Bingo, Instants, Casino and Slots games available to you to play – every single game on the site is listed along with its game rules. Your £10 Free ( to play slots and/or bingo) requires neither a deposit or a credit card to reap that benefit. Click on What’s On and you will then have your choice of proceeding to either the Bingo Schedule, Bonus Offers, Free Bingo, Mega Bingo, Tourneys & Comps or Refer a Friend. For instance under the Bonus Offer heading you have listed and explained the; (a) Sign Up Offer, (b) 300% First Deposit Bonus, (c) Reload bonuses and (d) Claim a Promo. The 300% First Deposit Bonus is available to everyone making their first deposit. With 300% of your initial deposit you can really start playing at Bingo Café! As far as Free Bingo is concerned, be advised, games are available each day in both the Bistro Bar and Abbey Road rooms for 75 Ball and 90 Ball games. They are played randomly between noon and midnight – so plenty of chances for free games! With regard to Mega Bingo games, in the Mega Bingo Marathon, all games (played every single day at 10pm) are £500 Must Go games (£5,000 Jackpots). Apart from the Saturday night games during the month – these particular games are all worth double that, at £1,000 each. Its well worth noting that card prices are just 50p each for all games. And that you can do even better than that – because if you buy 10 cards you will get another 10 for free! Which means you really would then be paying only half price for your cards. 20 for 10! This entry was posted in Online Bingo News and tagged Bingo Cafe on May 21, 2012 by SuperAdmin. Bingo Cafe now have free bingo games running each week on a permanent basis now, but it does depend on your loyalty status as to what ones you can play. All free bingo games at Bingo Cafe take place in their terrace room and you will currently find them on a Wednesday, Thursday and Sunday. If you on the lowest loyalty level (which is bronze) you will be treated to one hour’s worth of free bingo each week, the top loyalty tier however (diamond) can expect to play 3 hours of weekly free games. To be eligible for this offer in the first instance though, you do need to have made at least one deposit into your account within the last 7 days. Free bingo brings you exactly what it says on the tin here, so to play you just need to head to their dedicated room and grab your tickets. Key games at Bingo Cafe include the renowned Mega Bingo and 5 reel slots of bingo. As the name pretty much suggests, slot of bingo combines both bingo and slots in one, so this is a great game to play if you are into both. Slots of bingo is a 5 reel 9 pay line progressive slot machine which comes loaded with a fun free spin bonus round. Spin in 5 (wild bingo) symbols and you would have just landed the progressive jackpot. Mega Bingo has got to be one of the best networked games around at the moment as it brings you the chance to win big guaranteed cash prizes every day of the week. £500 must go jackpots are up for grabs nightly at 10pm and it is possible to win up to £5,000. The minimum payout is set at £500, so that is the least amount which can be won on Mega Bingo. As these are networked, mega games can be accessed at three different sites on the net which include Bingo Cafe, Bingo Liner and King Jackpot Bingo. There is a dedicated mega bingo game room, so you can pre-purchase your tickets – alternatively you can just turn up on the night and play. This entry was posted in Online Bingo News and tagged Bingo Cafe on October 10, 2011 by SuperAdmin. Have you wanted to get your hands on an Apple iPad2, a Dell all in one 22 desktop computer or even a brand new Dell Laptop? Well if you answer is yes, to just one of these items or all of them you are not going to want to miss out on playing in the mega bingo game this Saturday night at Bingo Cafe online. All three of these amazing prizes (Apple iPad2, Dell Laptop, Dell computer) will be up for grabs on 25th June at Bingo Cafe in the mega bingo game which is set to take place at 10pm. You bingo ticket prices for this mega bingo game are set up £1 each to purchase and Bingo Cafe also have a great (ticket purchase) deal running on this one. If you buy 5 tickets for the Saturday night mega bingo tech game giveaway, they will give you 10 bingo tickets free – yes free. So a purchase of 5 tickets would give you 15 tickets for the game (which means these tickets would have in effect only cost you 30p) each. Not bad when you consider the great prizes on offer. Mega Bingo games run every week at Bingo Cafe and they usually bring you the chance to win big guaranteed cash prizes. Mega bingo are networked games and they can be accessed from Bingo Cafe, Bingo Liner or King Jackpot Bingo. You can log onto any of these bingo sites and play mega bingo. You are able to pre-purchase bingo tickets for mega bingo games, so you do not even have to be online when they play. Once you have bought your tickets, you can purchase more later on if you wish – so how many tickets you have is not set in stone until the game actually plays. If you are online and want to watch the game, simply click on the mega bingo icon from the game lobby before it kicks off. If you miss the mega bingo game you can still see the outcome of it by visiting the (my account page) and looking at your game history. This entry was posted in Online Bingo News and tagged Bingo Cafe on June 23, 2011 by SuperAdmin. Make sure you enjoy the buzz of that Bingo Café Walk & Talk Software, see your avatar strolling through the rooms, sitting at a table, playing and (best of all) winning at Bingo Café! Grab that free £10 players get (for simply signing up – no deposit required). Play Bingo – Play Slots – Play Casino games! You’ll find both quality and variety at Bingo Café! “Thanks for the awesome site. Obviously the win and the new games. …” “homer26” won £4,500 on ‘Riches of Wonderland’. “I am very excited about winning my jackpot. I just knew I was my turn.” “Lovely46” won £2,254.50 on ‘Slots of Bingo’. You’ve got a good chance of experiencing that winning feeling at Bingo Café players! Were you up very early this morning? Maybe you even had insomnia, well if you did you should have played ‘Hang Joe’ and ‘Joe In The Box’ at Bingo Café. £50 up for grabs and you can even get 5 cards for Free when you buy 10! A little later in the morning (6am to 7am) there was the great ‘Fast & Furious’ game – again you could get 5 Free for every 10 you buy at Bingo Café! From 12 midday to 1pm, you again can experience ‘Hang Joe’ and ‘Joe in the Box’, at 1pm to 2pm you can enjoy ‘Jail Break’ and win £50 – believe it or not you can also get 5 cards for Free (for buying 10) with this game as well! Enjoy the fabulous play at Bingo Café! & Good Luck! This entry was posted in Online Bingo News and tagged Bingo Cafe on February 16, 2011 by SuperAdmin.